Venezuelan migrants sit upon arrival to a new, refugee-style camp set up by the government in Bogota, Colombia, Nov. 13, 2018. Colombian authorities moved homeless Venezuelan migrants to a soccer field filled with yellow tents and cots Tuesday, as the number of migrants fleeing their nation's economic and humanitarian calamity continues to rise. 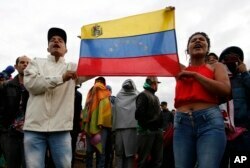 The first migrant camp for Venezuelans in Colombia's capital sparked a protest from residents who said they feared their new neighbors would bring crime and disease — the latest hint of escalating tensions throughout the region over the spillover of Venezuela's crisis. "They want to ruin our communities!" a man cried out from his balcony overlooking the field of tents, later switching to English and yelling, "Welcome to the jungle!" Colombian officials had been reluctant to set up refugee-style camps, even while similar sites have been created at Ecuador's border with Peru and in Brazil. The new camp is modeled after a temporary refugee settlement for Syrian arrivals in France. 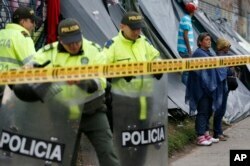 Police stand guard at a makeshift migrant settlement near the main bus terminal in Bogota, Colombia, Nov. 13, 2018. Authorities fear camps could become permanent fixtures and hinder Venezuelans from integrating into society. But with over 1 million Venezuelans now living in Colombia, officials said they had no choice but to offer tents to destitute migrants. "There's nothing else left to do," said Cristina Velez, Bogota's secretary for social integration. The migrants taken to the camp had been living in a park outside a bus station in conditions considered a potential public health risk. Families with young children were living cramped together alongside railroad tracks and cooking food over makeshift fires. Many had reached Bogota after long walks by foot and didn't have enough money to rent a room. Velez said Colombian officials talked with their counterparts in Paris over Skype to determine how to create a temporary camp, settling on a model that would keep families together while dividing up single men and women into separate tents. Migrants will be allowed to stay at the camp for up to three months and will be given information on accessing education and health care. The initial capacity for the camp will be 500 people, though Velez said officials will evaluate whether a more permanent fixture is needed. "We are going step by step because everything has changed very quickly," she said. A young Venezuelan migrant waits next to her family's belongings before leaving a makeshift migrant settlement near the main bus terminal in Bogota, Colombia, Nov. 13, 2018. The current exodus from Venezuela began in mid-2015 and has climbed steadily as Venezuelans face crippling hyperinflation, food and medicine shortages, and high crime. According to the United Nations, a total of 2.3 million have fled in the last three years alone. Colombia has received more migrants than any other nation at a time when it is already tackling a litany of domestic issues including surging coca production and a fragile peace process with leftist rebels. The arrival of so many Venezuelans has sparked xenophobic attacks throughout the region. Last month, a group of Venezuelans living in Colombia's capital said a mob beat a man to death and ransacked their homes while shouting slurs against foreigners. In Brazil, violence erupted after a local storeowner was stabbed and beaten in an assault blamed on Venezuelan migrants. As officials transported the Venezuelans to the new camp in Bogota, a dozen angry residents stood in front of a gate attempting to block their arrival. Residents in a large new condominium sat on their balconies now overlooking a field of yellow tents and cots and took photos. Several said they were angry officials hadn't given them advance notice while others worried Venezuelans would take their jobs. Venezuelan migrants protest the creation of a new, government-organized camp, which migrants can move to voluntarily, as they stand outside their current tent city near the main bus terminal in Bogota, Colombia, Nov. 13, 2018. "I'm going to be left with nothing," said Esperanza Contreras, 60, who sells grilled corn and said she feared Venezuelans willing to work for less would steal her customers. Still others complained that Colombian officials chose a field prone to flooding and expressed worry about sanitary conditions for several hundred migrants sharing 10 portable toilets. They said officials should do more to make sure migrants have access to safe water, food and jobs. "Not even animals should be there!" Giovanna Sanchez, 35, shouted into a microphone outside the camp. Venezuelans arriving at the camp said they were jolted by the protest. "I feel less safe because of what we're seeing outside," one man said. "They don't want us here." As they completed a registration process and made their way toward the tents, many said they felt deceived by authorities who had promised showers and food. Ivonne Jaimes, 27, cried as she sat on a cot with her 1-year-old son wondering when she would be able to bathe him. She feared they would end up spending more money living at the camp since they are not allowed to cook inside. "I feel trapped here," she said.